Peterborough Northern Star players celebrate a goal in their FA Vase tie against Sleaford. Photo: Chantell McDonald. @cmcdphotos. After the drama, joy and despair of FA competition action in the last seven days, it’s back to the grind of league football tomorrow (October 20). Peterborough Sports will be pleased about that. 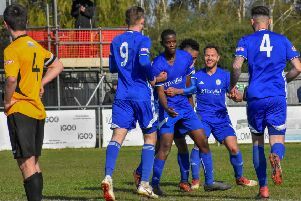 They went out of three cup competitions in 10 days (FA Cup, FA Trophy and Southern League Cup), but they take their unbeaten Evo Stik Southern League Cup record to lowly Aylesbury tomorrow. Yaxley, who won the first FA Trophy match in their history at Corby last weekend, are also in Division One Central action at home to Didcot (3pm). Winless Spalding United will attempt to get off the bottom of the table in Evo Stik North East by beating Sheffield FC tomorrow when Stamford AFC will be expected to maintain their push for promotion at home to Carlton. Fresh from a a thrilling FA Vase tie win over Sleaford, Peterborough Northern Star host Harborough in a United Counties Premier Division game. The top two in the top flight clash as leaders Daventry host Pinchbeck United and there’s a big game in Division One as fifth placed Blackstones entertain second-placed Lutterworth Town. March Town are going well in Division One North of the Eastern Counties League. They moved up to sixth after a midweek win at King’s Lynn and now take on third placed Mulbarton Wanderers at the GER tomorrow. East Division: Spalding United v Sheffield FC, Stamford v Carlton Town, Wisbech Town v Loughborough Dynamo. Division One Central: Aylesbury v Peterborough Sports, Yaxley v Didcot Town. Premier Division: Daventry Town v Pinchbeck United, Holbeach United v Oadby Town, Newport Pagnell Town v Deeping Rangers, Peterborough Northern Star v Harborough Town. Division One: Anstey Nomads v Bourne Town, Blackstones v Lutterworth Town, Huntingdon Town v Holwell Sports. Division One North: March Town United v Mulbarton Wanderers, Wisbech St Mary v Diss Town.